(AUSTIN) — Members of the Senate Finance Committee on Monday considered the budget for the largest slice of state spending: public education. The Senate budget proposes spending about $112 billion in general revenue over the next two years, and more than half of that goes to pay for public education. The Senate budget bill, as filed, adds $2.4 billion to cover projected enrollment growth over the next two years, but also $6 billion above that to pay for increased teacher compensation and to offset whatever revenue is lost by any property tax reform measures that become law. Both of these issues were among six labelled as emergencies by Governor Greg Abbott in his State of the State address last week, opening the door for immediate legislative action. Abbott, along with Lt. Governor Dan Patrick and House Speaker Dennis Bonnen, have vowed to fix the school finance issue this session. Senate Finance Chair Senator Jane Nelson of Flower Mound and other members of the panel pushed back against reports claiming that the state share of public education funding is decreasing due to policy decisions at the state level. It's the way that Texas pays for schools that causes this, said Nelson. For the most part, local property taxes go to pay for local schools, and that money gets kicked in first, with the state making up the difference between local revenue and statutory entitlements. So if local revenue for a certain district goes up, due to tax rate increases or growth in property values, the state sends less money to that district. "I think there's some misconceptions out there in the public about how this works," said Nelson. "If we want to change it, so be it, but that is the way it is, and the way it's been for as long as I've been here." That system has been on the books since 1949, she said later, and while the legislature can decide to change that system, it's not a new phenomenon. "It doesn't do any good to portray things inaccurately," said Nelson. "The Supreme Court said it's constitutional, but it's a mess... we need to fix it but we need to work together to fix it." 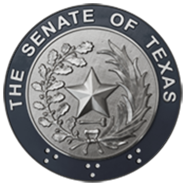 What most people think of as "education funding", said Senate Education Committee Chair Senator Larry Taylor of Friendswood, is actually just a part of the total funding called "maintenance and operation". That doesn't include things like facilities funding, instructional materials, and other pools of money that often don't get figured into the local-to-state funding ratio, he said. Taylor's Education Committee will consider how to address a school finance overhaul this session. He will likely author the Senate bill aimed at education finance reform, and while the details haven't been released, Taylor gave a preview of how he expects it to proceed. "We are making great strides in education. I am excited about this session," he said. "We're going to put more money into education, but we're not just going to put more money into it, we're going to direct that money into programs that really work, have a history of working, and identifying where we really need the most help and sending the aid to where we need it the most to make a significant difference." Also Monday, the Senate Property Tax Committee approved the major property tax reform bill of the session, SB 2, sending it to the floor for consideration by the full Senate. Before taking the vote, members approved 15 amendments to the bill, which were mostly technical corrections. Still in the bill are the major provisions relating to transparency, appraisal review board requirements and automatic trigger for rollback elections. Also unchanged is the proposed 2.5 percent rollback rate, which would require voter permission to set a tax rate increase that exceeds that number. One amendment to the bill would change the name of "rollback rate" to "voter-approved rate" to help taxpayers better understand what it means. One substantive change made on Monday is an opt-in provision for smaller taxing entities. Under the filed version, the bill exempted entities that collect less than $15 million in combined sales and property tax revenue. The amendment added would require those entities to hold elections on the next uniform election date, likely May of 2020 if the bill is signed into law, and ask voters whether they want that taxing authority to fall under the provisions of SB 2. The Senate will reconvene Tuesday, February 12 at 11 a.m.